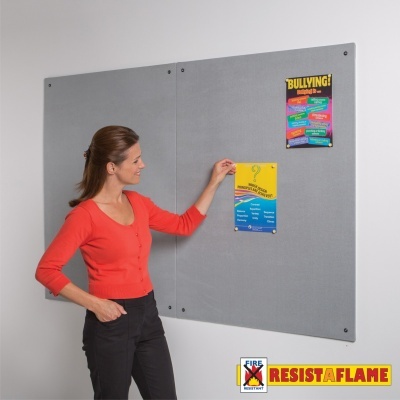 Resist-A-Flame is a range of wall mounted frameless fire-retardant noticeboards. The boards can be mounted either portrait or landscape. Resist-A-Flame is a market leading range of fire retardant noticeboards fully constructed and tested to meet the latest building and fire regulations. Ideal for use in public buildings and commercial applications. The Fully assembled board is certified to BS EN 13501. Available in a wide choice of 11 woven cloth colours. The 3 larger sized Resist-A-Flame notice boards are supplied in 2 parts.